Please note: A commenter below revealed that the Sharp particle detector within this device (model GP2Y1010AU) cannot detect particles as small as pm2.5, so this device is not suitable for detecting those values. It still works for detecting larger particles, specifically those over 0.1mg/m3. 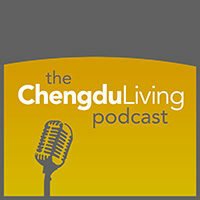 Spend some time in Chengdu and you might find that the most common concern among expat residents is the polluted air. Many of us track pollutant levels using our smartphones everyday, wear protective masks when running or cycling, and outfit our homes with low (and high) cost air filters and automation systems. For me, the next step after setting up filters and automation in my home was to measure indoor pollutant levels myself to identify and troubleshoot potential problems. A common and trustworthy device used to measure air pollutants is the Dylos 1100, which is American-made and costs around $300 on Taobao depending on the options you select (like an optional PC interface for downloading graphs). Although data gathered from the Dylos is rock-solid (it’s what Smart Air uses to gather data for their Particle Counting blog), the cost is high. Surprisingly, I was able to find something 1/10th the cost on Taobao called the SamoAir: an unadorned circuit board encased in clear plastic. Does it work and is it worth the cost? The SamoAir is a tiny, imported monitoring device made by Sharp, attached to a circuit board with a small LCD display and an optional battery pack. It comes pre-assembled and operation couldn’t be much simpler: you plug it into a power source using the supplied USB cable and within seconds it begins displaying data. With the supplied battery pack it’s easy to measure pollution anywhere you go. Not only do you get a real-time readout of the current PM2.5 level, but after the device has been powered on for 12 minutes, it begins also displaying average particle levels in 12 minute increments by way of a blinking LED light. Green means the air quality is good, read means it’s bad, and a combination of lights can mean “Escape, Now” (direct translation from the product description). In my use, I almost never found air quality in Chengdu to be within the “Excellent” range, even after rainfall. With doors and windows closed an an air filter running, I got values within the 0-35 µg/m3 range, but ordinary indoor measurements were ordinarily within the 55 – 80 range. Values from inside second ring road were significantly higher than on the outskirts of the city, where pollution was lower in the Tianfu Software Park or the Xindu suburb outside of Chengdu’s third ring road. Air quality values measured by the SamoAir sitting on my open window sill were almost identical to real-time figures from the US Consulate with less than 2% variation. Although proximity to testing cites could be partly responsible, these values were around 25-70% higher than real-time PM2.5 data provided by the Chengdu local government. Need a device that collects identical data to official pollution-monitoring sites? You will spend tens of thousands of dollars on testing equipment and need to set it up directly next to an official testing site. Are you a local boss with plenty of cash? 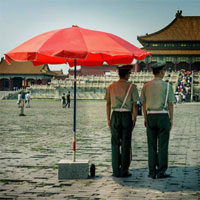 You’ll want an imported device like a Dylos, or industrial equipment which will cost hundreds of thousands of dollars. Want to measure pollutant levels indoors, or check the effectiveness of your air filter? This is the device for you. We cannot keep up with demand, and as a result, these ship 10-15 days after ordering. Regarding accuracy, each of these are hand tuned and there is slight deviation from unit to unit. 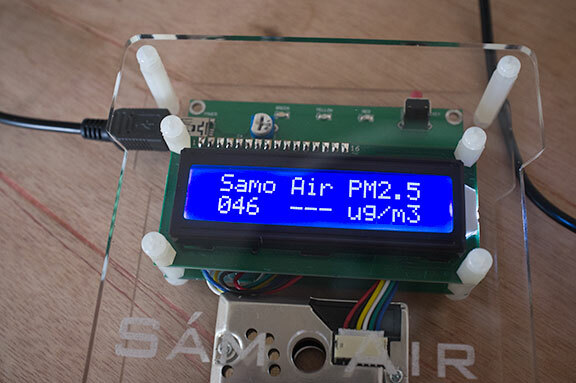 The SamoAir is intended to be used for daily observation of pollution levels in homes, offices, and cars. Measurements taken outside may not be accurate due to weather and wind conditions, but the sensor can be fined tuned to your needs and use. If, for anyone reason, you aren’t satisfied, we offer a 30 day back guarantee, along with a one-year warranty. Considering the price of the SamoAir, it’s hard to imagine a particle measuring device that provides more value than this. If you have one or more air filters in your home and want to test their effectiveness, this is the cheapest and simplest way to do that. You won’t be able to chart changes in air quality over time or measure pm10 pollution, but for basic needs, this will have you covered. 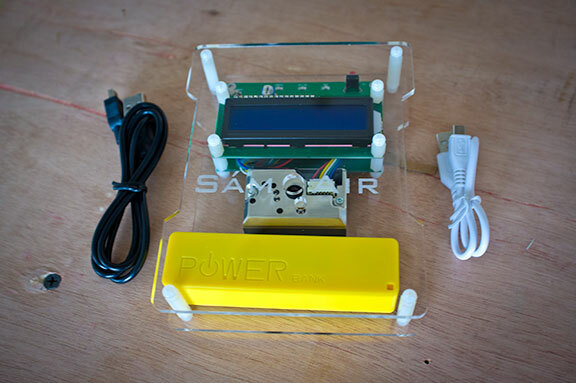 For an extra 30rmb, it’s worth springing for the internal battery pack which allows you to gather data from anywhere without a power source: SamoAir particule measuring device on Taobao. 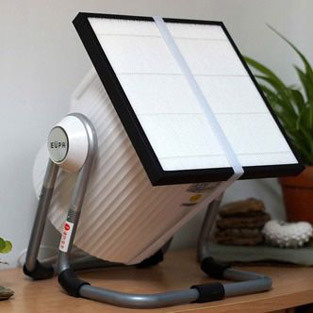 Interesting – HEPA filters on the air intakes in your apartment or something? Hadn’t even considered that as an option. Thomas here, from Smart Air. Neat! Do you have the data for comparing these values to the official PM 2.5 readings? I’d love to analyze it! The values which I got from this were wildly different from the official PM 2.5 readings, but I think that’s because there are so many factors of difference. Aside from the hardware, the location of the official detectors is different, I’m using the SamoAir inside, I have (your) filters running in my house, etc. I would like to collect the data from this and track changes (and make them publicly available) but unlike the Dylos with PC interface, there’s no practical way to track data other than manually, which becomes very tedious. The problem is if you google Sharp GP2Y1010AU0F (which the sensor this device uses) it isn’t specifically a pm 2.5 sensor. It’s a household dust and cigarette smoke sensor so probably also detects the larger particles, which would explain the higher readings you’re getting. This is clearly a fraudulent product. It claims to measure pm2.5 but the sensor it uses measures household dust and smoke. Check for yourself by googling Sharp GP2Y1010AU0F. Charlie, I’m sorry to hear that you wasted your money on this but no one will think any less of you for it. I think you should publish this comment to stop other people wasting money on this scam. Thanks for your comment Matt. After some investigation, you are right: the Sharp GP2Y1010AU detects particles over 0.1mg/m3 while pm2.5 is 0.025mg/m3. I’ve added a note to this top of this post to inform anyone who finds this article. I don’t consider this wasted money since it still measures air quality and this was intended as an experiment. Good man. I’m no expert but I believe 0.1mg/m3 refers to the density of the particles, not their size. I think it does detect pm2.5 but is also detecting larger particles. It makes no distinction between pm2.5, pm10, pm20 or even larger. That’s why your readings are higher than the official ones. I think the only use for it would be for a before/after comparison when testing an air purifier or something similar. Yup, that makes sense. That is exactly the purpose that I got it for, and although the readings alone aren’t indicative of actual pm2.5 levels, it’s useful for making a rough before/after comparison. It seems that for precise measurement you will need to spend 10x more and get a Dylos. Please give me a link to the sales site of SamoAir. I cannot find it. Hello. An old post, but still valid. I noticed there are a few models of SamoAir. Can someone tell the difference? Like the laser one? Also, do you know if anyone else is using this sensor in a more user friendly product that would do data capture? I saw site on Arduino, but too expensive just for that. I haven’t researched the differences, but all the information should be available either on their website or Taobao. I also haven’t seen this sensor used in any consumer devices, only this one.